Wow oh wow. Today was even better than I ever imagined, with food, frocks and a good nice cup of tea at hand. The Gables didn’t even know what had hit it when twenty-eight lovely ladies in most distinguished frocks descended upon them. Emboldened by Champagne, hems were upturned, fabric was stroked and necklines were poked at. As you can imagine, the dresses were fantastic. If I had to pick some favourites, I honestly couldn’t. What is fun is the game of spot the blogger! (for a full list check out the lovely Melanie’s post here). My journey to a SewCieTea dress was most definitely a long one. I’ll detail the construction more in another post, but to give you an idea of the crazy time commitment I was trimming the lace overlay at 12.55pm (SewCieTea started at 2pm), and replaced the zipper red basting stitches with pink basting stitches. Oh, did I mention that was with the dress form standing on the kitchen table while feeding the baby some quiche? Overall, I’m really happy with the finished result. The lace trim I was planning on applying to the skirt had to go, and the crinoline wasn’t ready in time. The Eliza dress was very simple in it’s design which made the lace feature more (and saved on some construction time). I would estimate that I’ve spent 30 hours on this (over two months). My husband thinks it was more. The dress swishes nicely, and has enough ease to fit in cakes, but gosh, 5m of hem is a WHOLE LOT OF HEM. The dress looks much more white in these photos than pink, which is really interesting. The net result? I need to eat some greens this week, before this dress gets worn again at a Ball on Friday night. With a crinoline. A big Thankyou to Melainie (PoppyKettle) for organising, Rachel (MyMessings) for photos, and to my lovely husband for helping me finish the dress, with cups of tea, beer, and also taking the baby out so I could finish hemming in peace! haha, yeah! I keep finding bits in my room. It’s a great technique though isn’t it! It was so much fun, you should come to the next one 🙂 I know it’s a fair bit of travel, but so much fun! I do love a happy ending! Even with all that stressing, you’ve made such a gorgeous dress! Even better is that you get to wear it again so soon!! 😀 I had the same thing with that white lace dress I made – the lace did appear to take over colour-wise in pictures, but the balance was clear IRL. I’m sorry I didn’t really get to talk to you today and compliment you on your beautiful dress! It looked so perfect & I really loved the effect of the overlay. I can’t say I’m surprised it took you so long to make- it must have been a real test of patience working with all that lace!! Thankyou! It was a little overwhelming with so many people to talk to, two hours just wasn’t enough. Gorgeous gorgeous gorgeous! I love a lace dress. I actually have one planned to wear to a wedding in May. yours is stunning! Well worth the effort Sarah. Your dress is stunning. It’s lovely too to hear that the dress is getting another outing. It’s too nice to hand out in the wardrobe all the time! Lovely! Time to put on a fancy hat and go frolicking through a field of flowers! Oh, you Australians and your opposite-of-the-northern-hemisphere weather patterns! My husband is convinced I spend more time sewing than I actually do as well 🙂 He (jokingly) says, isn’t it easer to buy clothes but he knows I enjoy it. Wow, there were so many of you, it looks like you had a great time and your dress is so beautiful. It was just so much fun, but now there are more dresses on my mental sewing list! You looked amazing – 30 hours very well spent I say!! It was so much fun – a perfect afternoon to be swishing around! What a great event! 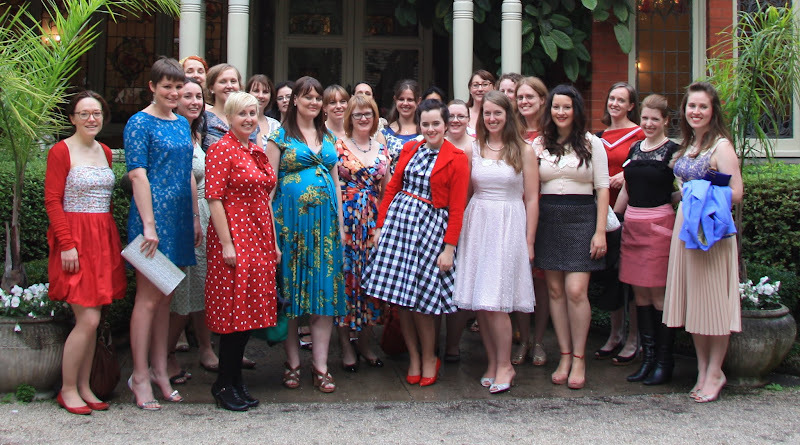 And what a triumph for you all to be wearing your own frocks. I hope you make it an annual tradition. We need more events like this in our lives, something to dress up for other than a wedding!